One of the most pleasant surprises in Star Wars: The Last Jedi was the return of Master Yoda to offer Luke Skywalker some advice when he needed it most. The moment was emotional, both for audiences and the performers involved--Mark Hamill can be seen getting very emotional during the rehearsals in the documentary The Director and the Jedi. 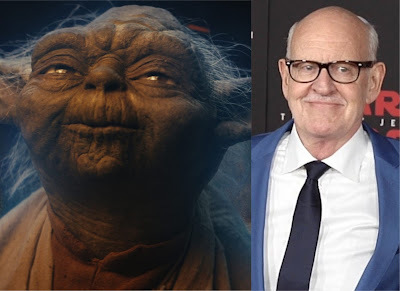 Yoda's return was kept a secret (mostly) during the production and promotion of the film and now Frank Oz, who both voices Yoda and performs the puppet spoke about keeping the return a secret in a new interview with IGN. "Several years ago I had lunch with Rian [Johnson], and Rian asked if I could do Yoda in the next Star Wars, and I said ‘Sure,’ because I thought it was just CGI. And then [Lucasfilm president] Kathy Kennedy, who I’ve known for quite a while, who’s fantastic, she called me about it and then I realized that it wasn’t CGI, that it was actually the character. I said, ‘Kathy, do you have any idea what’s going to happen here? This is tough!’ and she said ‘That’s okay, let’s do it.’ So, you know, the workshop made him and everything, and did a fantastic job,"
"I was told that that was going to be the surprise of the movie, so when I went to Pinewood I had to be a secret there. Although if people saw me… people DID see me, but if they questioned me it would have been fine because I shot Little Shop of Horrors ... there, and could have just said I had some meetings for movies. But the idea was to keep me off the credits. I was asked, ‘Could you have your name off the poster?’ and I said ‘Sure.’ So the idea was that that would be the surprise." "It would have to be [CGI], yeah. It would have to be. It’s far, far too difficult because I’m doing it with three other people. So it’s four people and you can’t just wing it. You’ve got to study every single word with four people." Oz is currently promoting his new documentary Muppet Guys Talking, which is available now!